Let’s be honest, it’s nearly impossible to look your best if you're competing in the Olympics — slicked-back ponytails and spandex aren't exactly flattering. Luckily, us plain folk can enjoy the games with a little more self-confidence, a lot less sweating... and an extra-long happy hour. Now all you need is the perfect place to watch the games, right? 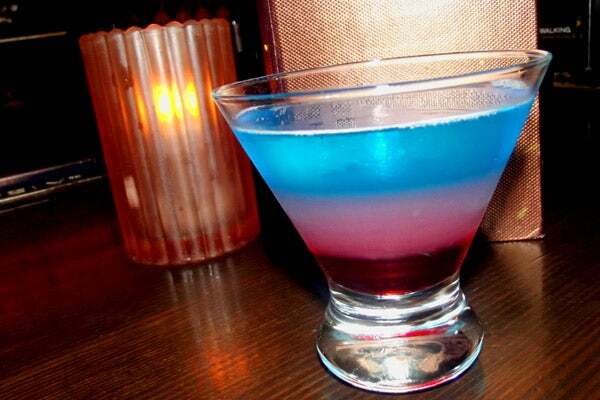 In celebration of Team USA, Lucky Strike Lanes is serving a red, white, and blue striped cocktail called “Lucky Stars and Stripes.” The drink's tasty combination of Pisco Porton, Blue Curacao, and Grenadine makes it the perfect libation to sip on as you cheer for Team USA. The place will be decked out with tons of flat screen TVs — and, in the true spirit of America, Lucky Strike will be offering half-priced drinks from 5 to 8 p.m.. If that isn’t enough to motivate you, then maybe the endless fun that comes with their ping-pong, billiards, and bowling will be the final push that sends you out the door. Cheers, Guvnah! Lucky Strike, 624 West 42nd Street (at 12th Avenue); 646-829-0170.